Insula Capitis Britonum et terrae propinquae. Despectus in insulam ex satellite NASA. 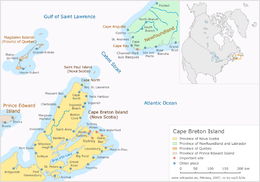 Insula Capitis Britonum (Anglice Cape Breton Island; Francogallice île du Cap-Breton; Scotice Eilean Cheap Bhreatainn; Mikmaq Únamakika) est insula in litore Atlantico Americae Septentrionalis sita. Nomen fortasse a Capbreton prope Baionam derivatur, vel maius probabiliter a vocabulo Breton, adiectivo Francico, a Bretagne nomine proprio vicissim derivato, Britanniam Minorem, regionem historicam Francicam, significante. Insula est pars Novae Scotiae, unius e provinciis maritimis Canadae. Akins, Thomas B. 1895. History of Halifax. Dartmouth: Brook House Press. Barlow, Maude, et Elizabeth May. 2000. Frederick Street: Life and Death on Canada's Love Canal. Toronti: HarperCollins Publishers. ISBN 9780006385295. Vicimedia Communia plura habent quae ad Insulam Capitis Britanniae spectant (Cape Breton, Cape Breton Island). Cape Breton Island Official Travel Guide. Novissima mutatio die 13 Ianuarii 2017 hora 09:53 facta.